It is with great sadness that the family of Doug Bear announces his passing, on Friday, October 26, 2018, at the age of 77. Doug will be forever remembered by his wife Agnes and his children, Wesley (Val) and Bariane (Darren). He will also be fondly remembered by his six grandchildren, Devan (Becky), Tasha (Brendan), Riley, Bree, Brett and Aaron, his two great grandchildren, Reid and Hudson and by his sisters, Ann, Vi and Gladys. The family would like to extend a special thank you to the GH-6 staff at the Health Science Centre and the staff at the Pinawa Hospital for the exceptional care they provided for Doug. We will be forever grateful. A celebration of Doug’s life will be held on Thursday, November 1, 2018 at 2:00 p.m., at the Pioneer Club, 32 Park Ave in Lac du Bonnet, MB. 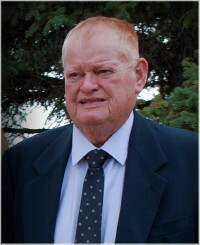 Memorial donations in honour of Doug may be made to the Canadian Diabetes Association or the Manitoba Lung Association. Our condolences to Aunty Agnes, Wes & Bariane, and all Uncle’s grandchildren. I shall miss Uncle’s phone calls and visits. He reminded me so much of my dad! Hugs and love to all of you. Agnes and family, we are truly sorry to hear this. Hugs from the Adrian Family. How very sad to receive this news on Doug’s passing. We all had many fun times in Norway House and Falcon Lake. We still cherish those memories! We are so sad to hear of Doug’s passing. Our sincere condolences to all of you and your families. We have some fond memories of our time together in Norway House. Our thoughts and prayers are with you at this difficult time. Dearest Agnes and family. Rosanne and I are very sad to hear of Doug’s passing. Our days in Norway House were filled with great memories. Our thoughts and prayers are with you and your family at this most difficult time. Agnes and family, I’m really sorry to learn about Doug’s passing. Doug was a good and generous person. Lots of good memories in Norway house…..My thoughts are with you in these difficult moments. My most sincere condolences. I feel privileged to have known you and Doug during my short stay in Norway House. I will always remember Doug’s “Joie de Vivre”… What a nice man? Hi Agnes our deepest condolences to you and your family.